when you go from a bunch of really great concerts to nothing, it can be hard. post concert withdrawals are real. i’ve been listening to my playlists (i make playlists of the music from the pertaining artists before the concerts; it’s one of my favorite forms of “research”) nonstop, or sometimes i just listen to the same thing. over and over and over daily. i’m looking at you, “be my forever” and “heartbeat song” and “the phoenix” (fyi the music vid is… unusual. i tend to listen and ignore the visuals). so what do you do when you’re concertless? make waffles. MATCHA waffles. i saw a matcha waffle at a local coffee shop when yang and i were “studying” back in february. we were both like OOH THAT SMELLS GOOD so i ditched my studying (i was just looking over notes for my p/np bio and chem of food and cooking class anyways) and looked up matcha waffle recipes. i didn’t sift the dry ingredients, and i mixed batter just until incorporated, not until smooth (otherwise the gluten gets too strong and the waffle gets tough). quick psa: GREASE YO WAFFLE IRON. the first batch stuck really badly. you can’t rely on the fat in the waffle to be enough to help out. 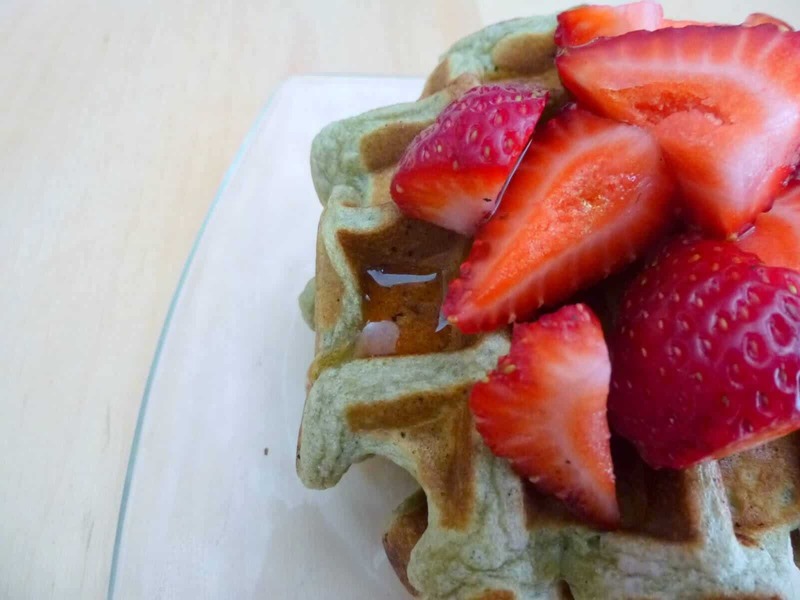 plain, these matcha waffles are a little bland. they’re tender throughout, and they don’t have much crunch around the edges. but with maple syrup, the matcha really comes out. it’s a little grassy, very fresh and with no bitterness (that you sometimes might get in tea). she served it with strawberries, honey; i did yogurt, strawberries and maple syrup. the strawberries and yogurt are by no mean necessary, but they are tasty; they add tartness and creaminess and freshness to the waffles. 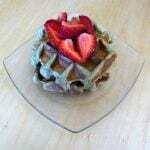 Perfect matcha waffles (fluffy on the inside, crispy on the outer edges) flavored with a hint of green tea (matcha). Mix the dry ingredients. In another bowl, whisk the wet ingredients. Add to the dry ingredients and whisk just until incorporated. Cook in a hot, well-greased waffle maker. Serve warm with maple syrup or honey, fresh fruit, yogurt, and/or whipped cream. Adapted slightly from Let’s Eat… Simple! sounds like a great plan! and thanks :3 another really easy matcha thing i like making is a matcha latte (i usually use the ratio from bon appetit’s recipe).